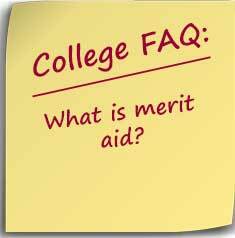 Merit aid refers to college awarded financial aid that is not based on financial need. The most commonly recognized form of merit aid is the scholarship. Scholarships may be awarded for academic skills or achievements based on talents such as athletic, artistic, or leadership. Other types of merit aid include tuition waivers or institutional grants not based on financial need. Unlike most outside scholarships, merit aid is awarded for all four years of college. Merit money is awarded by colleges to attract students to the college. Not all institutions provide merit money. The top ranked private colleges and universities generally do not provide merit money since they easily attract the country’s best students. Such schools claim that all of their students are academically talented and therefore only provide need-based financial aid. Student generally don’t apply for the majority of merit aid that is available. The college makes the awards during the admissions process, another indicator that merit money is used to encourage students to attend the institution. This means that students must apply to a college to find out how much money they might receive. However, some net price calculators provides estimates of merit aid as well. Merit money can range from a few thousand dollars to the full cost of attendance. A good student, not necessarily a straight A student, can expect to receive between $10,000 to $20,000 in merit money from less competitive private colleges. Private colleges may award minimal amounts of up to $5,000 to weaker students who can afford to pay the full cost of tuition. Public universities do award merit money but generally not nearly to the extent of private institutions. These awards will often be much more competitive and require a separate application. US News has a list rankings colleges on the percent of students receiving non-need based aid.